Putting British flowers back into every vase in the country is the mission of a new group who’ve been set up purely to promote British cut flowers. The name of this group is Flowers from the Farm. 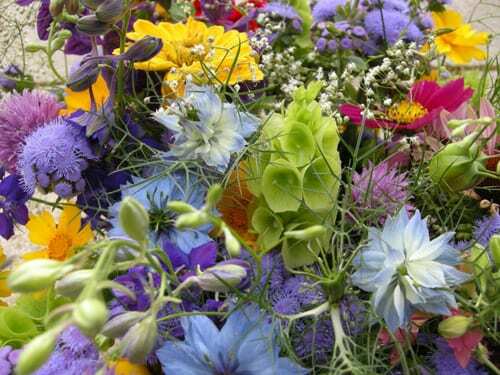 It’s a nationwide network of cut flower growers, whose members include farmers, smallholders and gardeners. Every member grows and sells their own flowers direct to the public at farmers’ markets, wedding fairs, country shows, roadside stands and via the internet. And the aim is for their website to be the go-to place when you’re looking to buy British cut flowers. Flowers from the Farm was started last April by Gill Hodgson of Fieldhouse Flowers in Yorkshire, after she searched in vain for a grower’s group to join. Gill said: ‘The idea took off immediately and I was lucky to have a great press release picked up straight away by the Yorkshire Post newspaper which, in turn, was picked up by the BBC who featured us on their Breakfast programme. The Great Yorkshire Show and the Harrogate Autumn Flower Show both immediately offered us free stands to promote British flowers at their events and that put Flowers from the Farm into lots of papers, magazines and glossies. Membership now stands at about 100 and the admin is too much for me alone. I also run my own flower business and we have a family farm. Flower from the Farm is not-for-profit and I’m just so keen to promote British flowers all over the country and give my time for free, but it’s getting to be too much. So, I’ve recently divided the country into nine regions, matching the NFU regional boundaries, and members have come forward to head up each area. The plan is for each of these co-ordinators to organise meetings and events in their own area and get British flowers into the news. The SW region is actually shared by three keen growers who all came forward for the job and have decided to work together. They’re racing ahead and have already put out a press release and planned their first event, which will take place next January. Up here in the NE, I was awarded an EU grant to investigate the feasibility of flower-growing here in East Riding and the pilot is coming to an end at the end of this month. I’ll be putting a report together and circulating it to all eight other regions in the hope that it will give each of them a blueprint for setting up a network in their area. 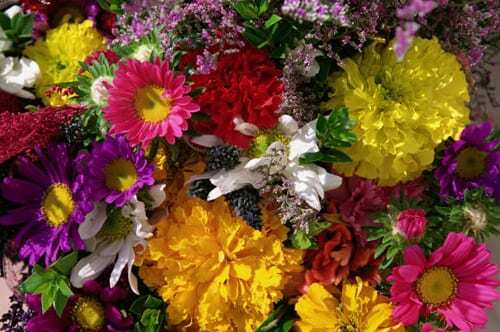 Here at Fieldhouse Flowers, I sell at the gate and farmers’ markets, as well as providing bespoke bouquets. I do weddings, run workshops and give talks to flower clubs. I love it. There’s an opening for others to do the same all over the country and I want to help them. Fresh British cut flowers are generally available from spring until October. Examples of flowers that you’ll be able to buy at this time of year are sunflowers, agapanthus, delphiniums, hydrangeas, lavender, dahlias, cosmos and phlox. 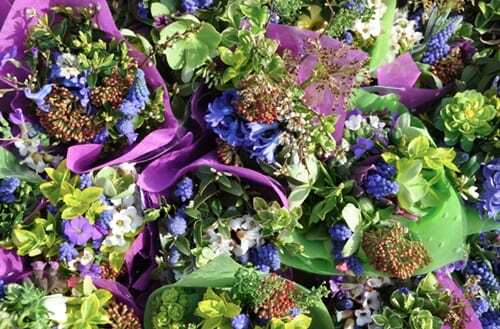 So, if you’re a florist or flower arranger, or would simply like to buy some fresh seasonal British grown flowers to brighten up your home, simply visit the Flowers from the Farm website. In the Find Your Local Grower section, click on the appropriate region and you’ll see a map showing all the locations of members. Many congratulations to Gill on setting up this wonderful network and I wish her and her members every success for the future. If you’d like to be kept up-to-date with news about Flowers from the Farm, they’re on Twitter and Facebook. I used the Flowers from the Farm website to find my local grower Rachel Dyson at Hollowmeadows in the Peak District in June this year when I put together a wedding shoot featuring and promoting British Grown Flowers. I was delighted with the response it got and I’m am so pleased to see that you’ve featured this fantastic trend which benefits not only Brides, but our flower industry too. Brilliant! Thank you very much Tracey for your comment. I delighted to hear that you’re already familiar with the Flowers from the Farm website and were able to easily source flowers for your shoot :-). Hi Annie. Many thanks for your comment and I hope that Flowers from the Farm goes from strength to strength! Rona, this is a great post. I was aware of many British growers on Twitter. But, so pleased to find out about this network. I think this has the ability to change the way florists buy flowers. Although, so many flowers are available all year round now – I think as florists, we should be aware of what is seasonal and available closer to home. Unfortunately, this cannot be done all the time, due to customer demands. We also cannot forget the employment that growers offer in third world countries. Even supermarkets are selling more British flowers than before, which hopefully will increase in the future. Thank you once again for highlighting a great cause…… I will support it all the way! Many thanks for your complimentary comment Tom. 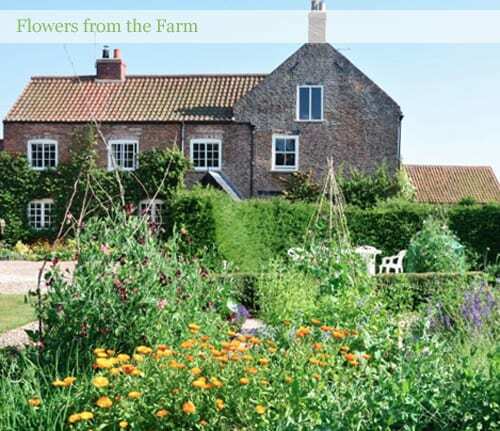 It’s great to hear that you’ll be supporting Flowers from the Farm network too :-). I commend all the efforts of the people behind this. I especially admire those who show love for their country by promoting their own products and supporting the abilities of their co-countrymen. Keep it up!